The history of the automobile (car) starts around 1769. Steam engine autos were created were the first method of human transport. The first internal combustion engine appeared in 1807 and this led to the modern gasoline or petrol-fuelled internal combustion engine in 1885. The year 1886 is regarded the year of birth of the modern car as we know it today with the Benz Patent Motorwagen by the German inventor Karl Benz. Anyone recognise that name perchance? Electric powered cars showed up briefly in the 20th Century very briefly, disappeared only to re-appear in the 21st Century. Initially cars could be divided into a number of eras based upon the means of propulsion. The early history of the automobile can be divided into a number of eras, based on the prevalent means of propulsion. Nowadays they are being defined by trends in things such as exterior styling, size, features and preferences. * Steam Powered wheeled vehicles, the “cave-man” forerunner to later cars. * Around 1672 the Jesuit missionary Ferdinand Verbiest built the first steam-powered vehicle as a toy for the Chinese Emperor. It could not carry a driver but is most probably the first ever working steam-powered automobile. Only very late in the 1800’s self-propelled auto’s large enough to carry people or cargo came about. Over the next decades such innovations as hand-brakes, multi-speed gears and improved steering were developed. The first automobile patent was granted in the United States of America in 1789. In 1815 the first oil-fired steam car was built. In 1867, Canadian jeweller Henry Seth Taylor demonstrated his 4-wheeled “steam buggy” at the Stanstead Fair in Stanstead, Quebec, and again the following year. The basis of the buggy, for which production began in 1865, was a high-wheeled carriage with bracing to support a two-cylinder steam engine mounted on the floor. 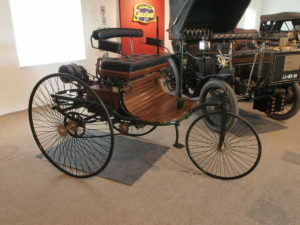 Some people see the vehicle designed by Amédée Bollé, it was built in 1873, and recognised as the first real automobile. This could transport groups of passengers. Seldon, also an American, designed not only a car with an engine but with four seats too. He underwent a mighty sixteen year patent process but was granted his patent in 1895. Karl Benz, a German in origin received his first car patent in 1886. Nikolaus Otto is responsible for the four-stroke petrol internal combustion engine which constitutes the most popular form of modern automotive propulsion. The battery electric car was founded and can attributed to A, Jedik and the lead-acid battery was invented by Gaton Planté in 1859. Steam-powered automobiles continued development all the way into the early 20th century, but the dissemination of petrol engines as the motive power of choice in the late 19th century marked the end of steam automobiles except as curiosities. It remains to be seen whether or not steam will make a come-back as a sustainable end energy-efficient way of propelling our vehicles. Electric cars enjoyed popularity between the late 19th century and early 20th century because they provided a luxury level of much more comfort and convenience of operation. These features could not be matched by petrol cars of that era. The electric starter was a great step forward and gave gasoline/petrol cars the hand-up they needed. Petrol cars were cheaper and also mass production of cars by the Ford Motor Company destroyed the market for Electric cars. It is accepted, generally, that the first petrol/gasoline practical internal combustion engines were completed almost simultaneously by several German inventors, however Karl Benz built his first automobile in 1885 and was granted the patent in 1886. To this day Benz remains a forerunner. The first motor car in Central Europe was produced by Czech company Nesselsdorfer Wagenba in 1897. The first company to build motor cars exclusively was Panhard et Levassor and they also introduced the first four-cylinder engine. Peugeot followed two years later. Oldsmobile, (about which music would be made), would dominate the American market at first. Within a year, Cadillac (formed from the Ford Company), Ford and Winton were mass producing cars. By 1900 many countries had national automotive industries. Cars in this era were seen as a novelty an often broke down. Roads were difficult to navigate and rapid technological development rendered even the newest models old hat. Rambler was the first company in 1909 to provide a spare tyre. These were mounted as a 5th wheel. Within the 15 years that make up this era, the various designs/experimentation and use of alternative power systems would become defunct since standards were now recognised. Things such as front-engine, rear-wheel drive, internal combustion and gears brought about these accepted norms that everyone expected. During this era technology and development was very fast. Safety glass came into vogue. The vintage era lasted from the end of World War I (1919), through the Wall Street Crash in 1929. In 1919, 90% of cars sold were open; by 1929, 90% were closed. The classic era began with the Great Depression in 1930 and ended after World War II in1946.Fenders and bodies began to dominate sales, also the rear for storage. Headlights began to be integrated into the body of the car. This era was exemplified by smaller cars and muscle cars. The Mustang made its appearance as did the Camaro. Independent suspension, turbo engine and fuel injection became buzz words. It was in this era that Japan became the largest car manufacturer in the world for a time. The modern era has been dominated by computer design. Front-wheel- drive and all-wheel-drive, diesel engines are at the forefront of our minds in this era. Styles in body changed too. The hatchback, sedan and sport utility vehicles dominate the market. The modern era has seen rapidly rising fuel efficiency and engine output. China has become the world leader in the manufacture of cars. What a long and illustrious history. This little glance back in history is certainly a new vantage point from which to view one of my most precious possessions. Who would you trust to service, re-condition or re-engineer yours? Welcome to our world of Excellent Quality Motor Engineering. Centurion Motor Engineering is a member of the Engine Remanufactures’ Association (ERA) as well as the Retail Motor Industry Organization (RMI) with national guidelines and standards in quality of service. We believe in doing our job correctly, the first time. Centurion Motor Engineering manage reliable drivers who can pick up and deliver from and to your premises. We have got qualified associates that can rebuild petrol and diesel engines. Utilizing the latest technology in engineering machinery we are one of the few fully operational motor engineering workshops in the greater Gauteng region.